The Chippewa Men's 73015 Black Leather 8 Inch Logger Work Boots are built for men who want genuine durability and quality in a pair of logger boots. The 8-inch uppers are made from full-grain, black oiled leather. Just like your skin, leather has many layers for st ... (see full details) (see specifications) #CHP73015. The Chippewa Men's 73015 Black Leather 8 Inch Logger Work Boots are built for men who want genuine durability and quality in a pair of logger boots. The 8-inch uppers are made from full-grain, black oiled leather. Just like your skin, leather has many layers for strength and durability, and it always adds style in addition to its resilience. Goodyear leather Welt construction is one of the most technologically advanced systems. The inner soles of the Chippewa boots are welted onto the bottoms, using a special waxed yarn, and then the bottom soles are sewn on the welt. This makes it virtually impossible to lose the soles. The construction between rubber soles on the men's boots allows you to have a more contoured fit. That means more comfort for you! Polyurethane is added to the rubber in the soles, and when heated at high temperatures, pockets are created. Air pockets are the best type of insulation, so good in fact that they use this process in roofing materials. This is good to know, especially in frigid temperatures. The rugged soles are oil-, chemical-, and slip-resistant, too. The lining on the interiors of the black boots includes Nylex, and the footbeds are padded for even more cushion. Your feet, ankles, and legs take a beating from shock with every step. The more absorption between you and the floor, the less tired you'll be at the end of the day. Steel shanks help reinforce your arches daily. Taking good care of your joints may not seem important when you're young, but later down the road you'll be glad you did. These Chippewa Men's 73015 Black Leather 8 Inch Slip-Resistant Boots have what it takes to provide you with the greatest durability around. 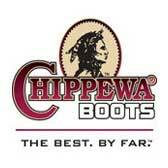 Chippewa also offers you variety with 6 versions of these leather boots. Take your pick and order today. GREAT BOOTS, WOULD BUY AGAIN. LIKE THE FREE SHIPPING. The most comfortable boots Ivé ever owned, from the very first day. Right out of the box these boots felt like I'd been wearing them for years (comfortable) to say the least. Well worth the money. Light weight for the summer months. I would recommend to anyone looking for a warm weather boot to try these. Hi Amy, Just wanted to let you know that I shipped the boots we are exchanging back to you yesterday. You've definitely earned our future business. It's hard to get customer service above & beyond these days from a lot of online stores or any store for that matter. Your patience and extra efforts are much appreciated, and somebody give this girl a raise!! Chippewa Boots: Men's 73015 Black Leather 8 Inch Logger Boots is being added to your cart.